We drove to Tokyo from Okutadami. We stopped on the motorway to refuel and people were all in sleeveless or short sleeved tops because the weather was so hot! It was a relief to get to a hotel where a) the beds were raised off the ground and b) there were no bugs! The view of Tokyo from my bedroom on the 35th floor was amazing. 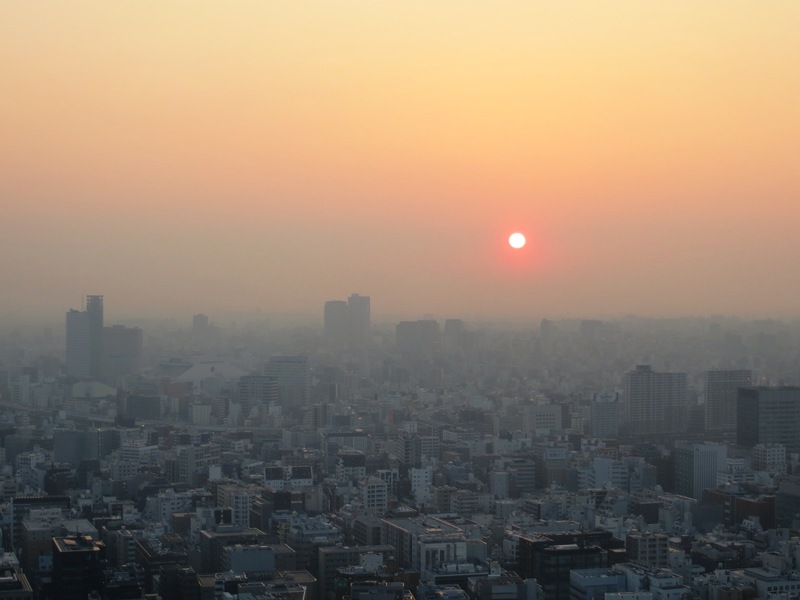 The view of the sunrise over Tokyo from my hotel room. We had a delicious Teppanyaki meal of steak and vegetables followed by cherry blossom ice-cream (in recognition of the fact that we were on the middle of the Cherry Blossom season in Japan). We took a 40 minute trip on the bullet train - very fast! It is hard to imagine what people would have thought of this train in 1964 when it first ran because it must have seemed so ahead of its time. With my Dad and and Flo, ready to board the bullet train! After some retail therapy, a cherry blossom cocktail and another blissful sleep it was time to surrender to British Airways for the 12 hour flight home!